A.W. Tillinghast crafted the Flourtown golf course at The Philadelphia Cricket Club in 1922. 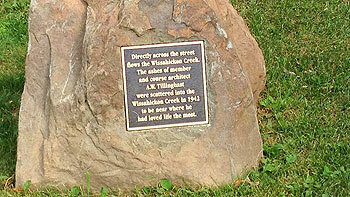 In the new millennium, the layout was renamed Wissahickon, after the creek which borders the property. In 2013, architect Keith Foster lovingly restored the Wissahickon course to a standard that Tillinghast would approve of. “There were no real blue prints at all,” Foster said. “I think that was really the challenge, truthfully. It was Tillinghast’s home course and he laid out in theory a skeleton routing, with the belief back then to lay it out and as the golf course matured to go ahead and introduce features that he would want to put in over time. The problem, of course, was that none of the features were ever documented. The PGA of America awarded Philadelphia Cricket Club the honour of hosting the 2015 PGA Professional National Championship on both the Wissahickon and Militia Hill courses. Take a bow please Mr Foster. Writing in The Confidential Guide to Golf Courses Tom Doak commented as follows: “'The Tillie in Philly' was sometimes elevated in local rankings because the Flynn courses tend to split the vote, but a recent restoration by Keith Foster has the locals drooling. Perhaps I was too embarrassed to notice its finer qualities after playing my approach to the par-4 2nd off the roof of the locker room." The analysis of the course by the previous reviewer is spot on with the several observations made. Credit has to go the club for the wise choice in bringing on board architect Keith Foster to bring back to life the many aspects Tillinghast originally provided. Anyone venturing to play the Wissahickon Course had best be ready right from the outset with two consecutive long par-4's that yield nothing save for high level execution play. The inward half of holes only ups the ante in terms of the demands players face. The ending quartet of holes caps the round in grand fashion. The long par-3 15th is a Redan-like hole and it's very good in flushing out the quality approach from an ordinary effort. The last three holes are all strong par-4's -- giving no quarter or respite. The ending hole is on par with another stellar Tillinghast notable closer with the likes of the 18th at Winged Foot / West. Miss the fairway at the 18th and getting over a stream that cuts across the hole near to the green is no automatic situation. For many the closing hole at Merion's famed East Course may get more recognition because of the stature earned when hosting various IUSGA Championships, however, the 18th at Wissahickon can easily claim the silver medal in the greater Philadelphia area. The City of Brotherly love metro area is stacked with quality layouts -- all on the private side. Only the immediate New York City area surpasses it for overall depth of courses in America. Overall, it amazes me how the Wissahickon layout is not included among the top 100 courses in America. I'd have the course comfortably in the top three in the Center City area because of how the blending of old and new elements were done with the utmost care and attention. Merion / East and Aronimink get plenty of attention but those coming to the Philadelphia vicinity should plan to wiggle some sort of invitation to play the Wissahickon Course. When you think your game is at the "A" level -- you'll find out if that's the case after playing 18 here. Famed architect and Club member, A. W. Tillinghast, built the Flourtown Course in 1922; however it was re-named “Wissahickon” in 2002. The name "Wissahickon" comes from the Lenape word for "Catfish Stream." The Wissahickon Creek runs a djacent to the course. In June of 2013, this original A.W. Tillinghast layout was closed for one of the most iconic restorations and renovations in recent American golf history. Towards the end of May 2014, the course re-opened for play and amassed 4500 rounds in the first month after opening. Thousands of trees were removed opening up views of the entire property and the golden wispy fescue that lines each hole. The apron around each green was removed, and now the edge of each green is the 1st cut of rough. Other interesting features include the abandoned (elevated) Reading Railroad line that runs between the 6th and 11th holes. On the front nine, I must admit that the back and forth nature of the parallel holes gets very repetitive, and from a distance, it appears like a row of bowling alleys. From the back tees, the course is 7100+ yards, so you’re hammering driver almost all day which removes the thought process with your tee shots. Many of the long par 4s feel like par 5s, so it’s a slog. Fortunately, the approach shots lend themselves to increasing the variety of the holes and the 105 yards par 3 3rd hole was certainly an iconic Tillinghast treasure (or terror!). The 3rd and 10th holes are ‘dualing par 3s’ right next to each other, with the 10th hole being 60 yards longer. Two of Tillinghasts best short holes right next to each other, and signature holes at that. They are a very welcomed break from the monotony of playing back and forth on unforgivingly long holes. A few greens were moved during the renovation, with the 2nd and 10th greens being the perfect example. The 2nd green was no less than 5 yards from the wall of the clubhouse, so they lazered the green (capturing it’s exact contours) and moved it 15 yards further away from the house. Right behind the 2nd green is the 10th green, which was also lazered and moved 30 yards away from the car park. It was unbelievable to think that an entire green was moved (and perfectly replicated) without a trace of evidence that it was touched since Tillinghast packed his bags and left. I much preferred the back nine primarily due to the routing becoming more imaginative and you started to consider angles off the tee. When we reached the back end of the property, highlights for me included to approach shot to the 14th hole displaying no less than nine bunkers sitting in front of the turtle back green. This was followed by the 240 yard 15th ‘redan’ hole which emphasized the dramatic changes resulting from the renovation. Along the right-side of the 15th hole, hundreds of trees were removed exposing huge mounds never seen before. The most exciting factor of the Wissachickon course is the location of the first tee and the 18th green. The first tee is on the putting green within arm’s reach of members enjoying their lunch on the patio, which is right next to the 18th green that sits 10 yards adjacent. The sound of knives and forks scraping off lunch plates only fuels the nerves of a golfer trying to impress the observant onlookers. The ashes of A.W Tillinghast were scattered in the Wissahickon Creek in 1942.